You can see the progress here, http://nizzagueco.fullstackbranding.com/ I'll be migrating this blog there. But in the meantime, please enjoy what I have here. ***Other future dates are available. Please feel free to inquire. I am glad to announce that because of the overwhelming support I got from the first workshop, I will be conducting another one on June 13. I am also happy to let you know that the first one was a success. If you missed the first one, then go ahead and give me a call or send me a message, reserve your slot now, I will guarantee that after the workshop, you'll be able to start your freelance career. 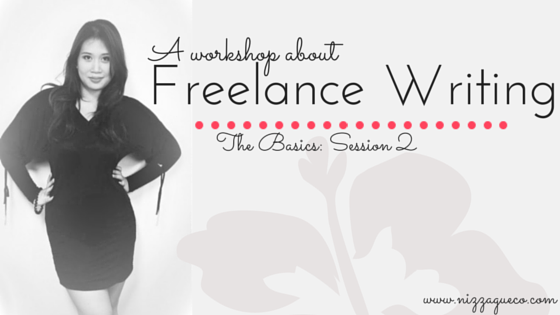 As a bonus for this blog post, I'll post photos of the first workshop for you to see. We had fun during the workshop, we ate, we shared stories, and we learned a lot. We ate while we are discussing. The pastry buffet was sponsored by Paulette's Choclettes.I'm not sure where the photos of the Choclette Brownies and Choclette Cupcakes are, I'll look for them and post it here too. We invited a financial consultant to help the writers' with how to save the money that they will earn. She gave us a presentation and we also had fun activities. After the discussion and the guest speaker. We had a Q&A for their clarifications. After that, they were given their certificates of participation. Now before I end this, I'd like to take this opportunity to thank my family for making this possible. Together, we turn what used to be a "bodega" into something presentable. Thank you Mama, Papa, Diko, Kuya Ronald, and of course, my lie and purpose, the Daddy and the Asti, the Mommy loves you so so much! Next I'd like to thank Mr. Ver Garcia for helping me promote the workshop. Of course who would forget my team. The best writing team there is. I want to thank Do It Write Solutions for helping me get through this and for also helping me promote the workshop. Lastly, I'd like to thank all the participants who came and gave me the opportunity to share what I know. Oh and lastly, we have been featured in People's Tonight. :) Here is the newspaper clipping. Have you heard of the word de-cluttering? Having to say that you need to de-clutter your room makes you want to cry and say "I am not disorganized! ", doesn't it? Well, hush now, de-cluttering is not the exact opposite of being organized. You can be an OC and have all your things color coded and organized up to the last bit, but still have a cluttered room. Clothes that you don't really wear anymore, or more bluntly those that do not fit you anymore. Nagpapapayat ako, magkakasya din ako dito sa damit na to kaya di ko muna pamimigay. "E nagpapapayat ka pa pala e. Get rid of those muna and just buy new ones pag payat ka na"
Anything that was given to you by somebody who is or who used to be special. Bigay ni "Ano" sakin to, ayoko itapon. May sentimental value to. "Ano naman kung bigay niya, ginagamit mo pa ba? E nag-te-take up lang ng space yan e."
Anything that you bought with your own money. Ang mahal ng bili ko dito, sayang naman. Wala na din naman bibili nito. "Kung di mo na ginagamit, kahit gano pa yan kamahal, wala siyang naitutulong sayo." Anything that you think you will still need in the future. Di ko muna itatapon to, baka kailanganin ko pa e.
"Gagamitin mo ba yan bukas o hanggang next month? Kung hindi, itapon mo at bumili ka nalang uli pag kailangan mo na." Whew! Why does the fairy god mother of de-cluttering make me feel like I'm talking to Madame Miriam Santiago or Senyora Santibanez? Never thought she had that sharp mouth. It made me want to declutter my room right away. But what does that mean? Do I have to have a general cleaning day? And throw away everything? Actually it is this simple: It means to throw or give away all the things that you actually do not need, but are currently just cluttering your room. Having said this, it makes me nag myself again, I've been wanting to de-clutter my cabinet and room for quite some time now but I can't seem to start. I was always waiting for "The Day". The day when I will have time to have a general cleaning and successfully de-clutter and clean my room. But then again, is there such a day? The bitter truth finally bit me. There is no such "Day" I was only fooling myself and falling into the trap of procrastination. 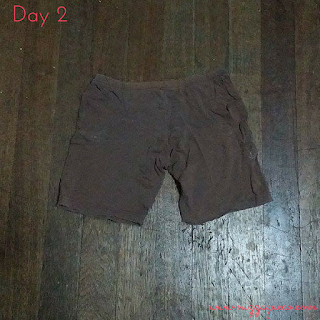 So instead of waiting for the day where I can de-clutter my room, I thought of starting today and making baby steps. Every day, I commit to throwing or giving away one thing from my room or closet. I reckon I will be able to finally de-clutter my room no matter how slow my progress is, right? Why is it cluttering my closet? -Because I haven't worn it yet. I kept thinking I might want to wear it some day. -I might as well give it away now, it looks like I won't be wearing it anytime soon anyway. 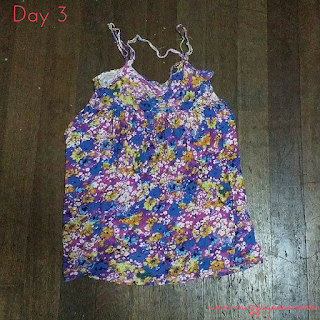 -I will give it to Pia of Pia Thought for her Ukay OK Page. -I actually don't know. I can't wear it anymore because it is faded and it has two big holes already. -Because I keep on forgetting to throw it already. 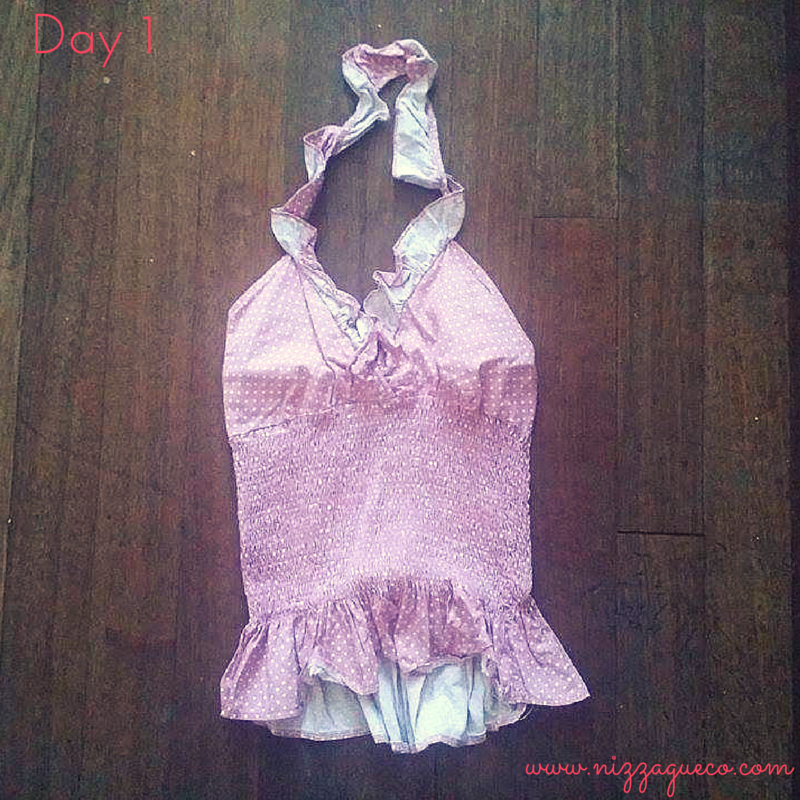 The neck lining is already loose and it hangs lower and past my breast. 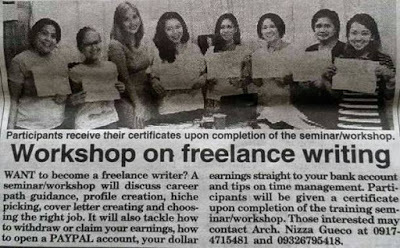 -I might as well turn it into a "basahan"
We will have another workshop on June 13. Please stay tuned as we release the official announcement. PRICE: 1500 per slot. Refer to the poster for group discounts. 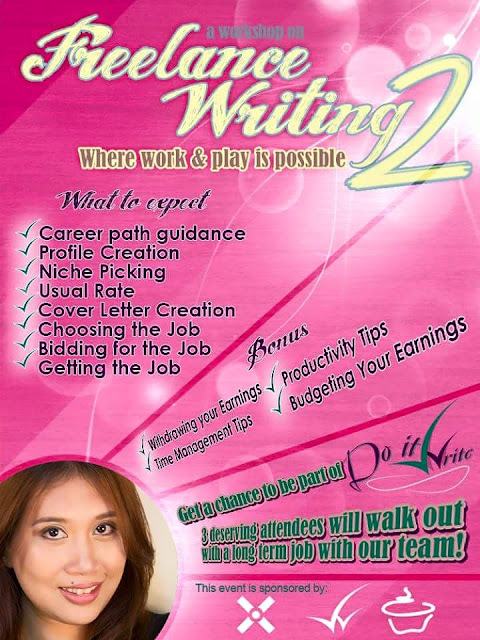 Nizza is an Architect and a fulltime freelance writer, she handles writers and coaches those who want to earn online. She is a Mom to a cute little girlie Aljanna Silver. She sells makeup online, she bakes and sells chocolate pastries at Paulette's Choclettes, and she accept website design jobs. Most of all, she is a self-confessed lipstick addict! Be Trendy And Fab. Shop At The Newest Instashop In Town. Project De-clutter: Get Rid of what you don't need. 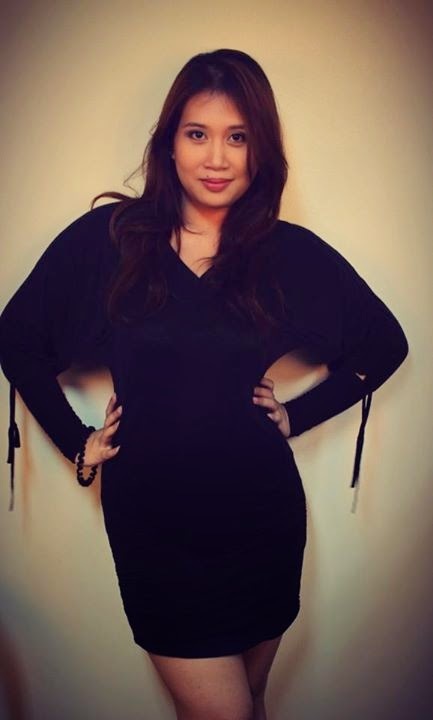 Nizza Gueco is a site to showcase what she can do and how she can help you.